Shows cardiovascular properties - blood pressure, etc. and neuroprotective properties - helps with memory, brain fog, stamina and helps prevent seizures. Hypertension. 2016 Mar;67(3):541-9. doi: 10.1161/HYPERTENSIONAHA.115.06624. Epub 2016 Jan 18. Sun Q1, Wang B1, Li Y1, et al. 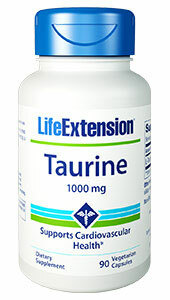 Taurine, the most abundant, semiessential, sulfur-containing amino acid, is well known to lower blood pressure (BP) in hypertensive animal models. However, no rigorous clinical trial has validated whether this beneficial effect of taurine occurs in human hypertension or prehypertension, a key stage in the development of hypertension. In this randomized, double-blind, placebo-controlled study, we assessed the effects of taurine intervention on BP and vascular function in prehypertension. We randomly assigned 120 eligible prehypertensive individuals to receive either taurine supplementation (1.6 g per day) or a placebo for 12 weeks. Taurine supplementation significantly decreased the clinic and 24-hour ambulatory BPs, especially in those with high-normal BP. Mean clinic systolic BP reduction for taurine/placebo was 7.2/2.6 mm Hg, and diastolic BP was 4.7/1.3 mm Hg. Mean ambulatory systolic BP reduction for taurine/placebo was 3.8/0.3 mm Hg, and diastolic BP was 3.5/0.6 mm Hg. In addition, taurine supplementation significantly improved endothelium-dependent and endothelium-independent vasodilation and increased plasma H2S and taurine concentrations. Furthermore, changes in BP were negatively correlated with both the plasma H2S and taurine levels in taurine-treated prehypertensive individuals. To further elucidate the hypotensive mechanism, experimental studies were performed both in vivo and in vitro. The results showed that taurine treatment upregulated the expression of hydrogen sulfide-synthesizing enzymes and reduced agonist-induced vascular reactivity through the inhibition of transient receptor potential channel subtype 3-mediated calcium influx in human and mouse mesenteric arteries. In conclusion, the antihypertensive effect of chronic taurine supplementation shows promise in the treatment of prehypertension through improvement of vascular function.